If good things come in small packages then what's in there. 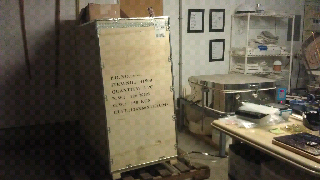 Could it be a sandblasting cabinet? I made these and other similar pieces thinking of the biblical story of Ruth. Just as she went out to the fields to glean barley after the harvest in the fields of Boaz, I used the valuable glass remaining from other project to make these peices. 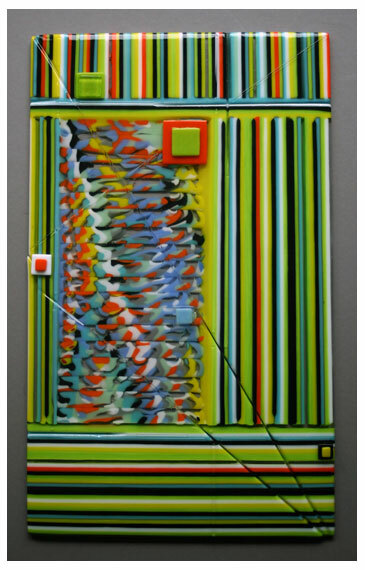 The way I obtained the glass, how it was used and the color pallett all made me think of Ruth out in the field of grasses. It is a story I had heard and read many times throughout my childhood. I had not thought of it in years and yet it came back to me in vivid detail as I worked on preparing this series of peices. These peices were delivered to Artisans of Rocky Hill in November. Green is not a color I normally gravitate towards. Yet for some reason I decided I wanted to make a bowl from various shades of green. I had originally planned to place the top layer on a clear base but it just didn't pop. Nothing I had worked quite as well as the white paper I was using to create my personal pattern. So today I stopped at Wired Designs Studio to pick up a sheet of lacy white to serve as a back drop. Problem solved the piece was set for a firing just a couple hours later. This will be the second firing for some of these pieces which were made in advance. 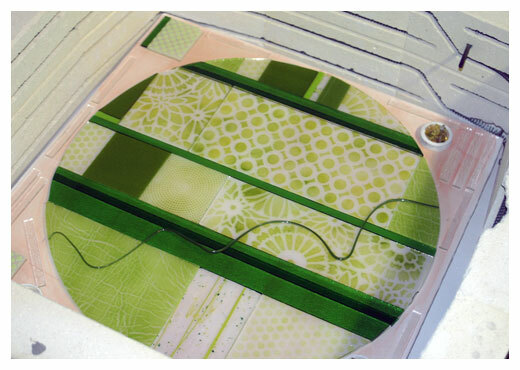 If all goes as planned tomorrow I should open the kiln to a 19" round tile ready to be cold worked. Design your thank you cards with Shutterfly. I just took advange of a great black friday deal and ordered these cards from Shutterfly.com. I think they will be great cards for follow up thank you notes. Don't you? 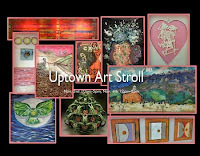 This weekend is packed full of activities starting with Up Town Art Stroll in the quaint historic neighborhood of Olmos Terrace. The event is Saturday, November 3rd from 10am to 5pm and Sunday, November 4th from 12pm to 5pm. I'll be at location #17. Check online for a studio map with detailed information. 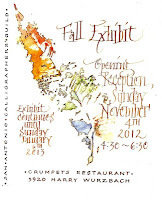 Sunday, November 4th is the opening of the San Antonio Calligraphy Guild's Fall Exhibit. 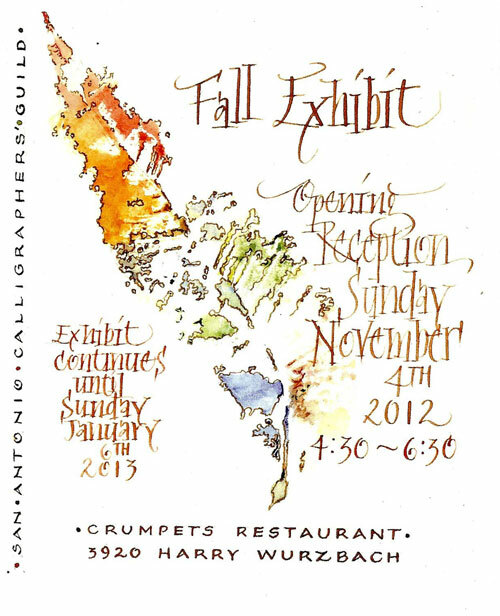 Join us from 4:30-6:30pm at Crumpets Restaurant at 3920 Harry Wurzbach for an opening reception. The show will continue to hang through January 6, 2013. 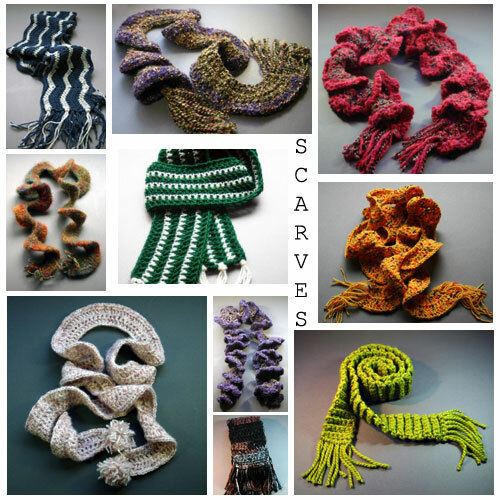 With fall just around the corner, I posted a variety of scarves in my Etsy store this weekend. Wishful thinking for cooler weather. It can't come soon enough for me. Kilnformed Soda Lime Glass Bowl 19.5"
As a follow up to the quilted bowl I took to Artisans of Rocky Hill in June, in September I brought this transparent bowl in red, orange, yellow and amber. 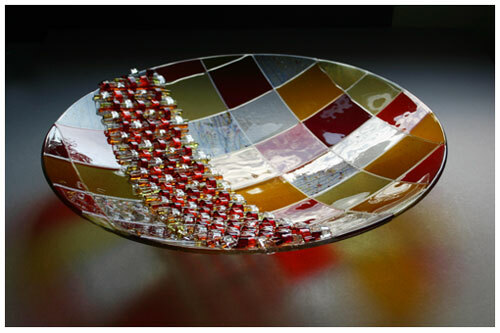 The warm quilted feel is accentuated by the glass weave which stretches down one side of the bowl. In addition, I brought a slew of matching ring dishes and small sushi plates which lined the entry table to artisans when I left. It was a beautify glow of color in the afternoon sunlight. The first weekend in June I took a workshop from the Book Art Babes and learned a binding originally developed by Gary Frost. This was a clean, simple book made fun with the colorful hand painted pages. There where bits of torch time here and there to practice making simple beads and twisted cane for a quilted kiln formed bowl I was working on. 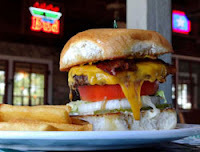 On Sunday, June 10th David and I were very pleasantly surprised with a fabulous review of the restaurant in the San Antonio Express News. This changed everything we did for the next few weeks as our volumes went through the roof and we did everything to just keep up. June 16th I made my monthly drive to Fredricksburg, Texas to spend time at Artisans of Rocky Hill and take new work. 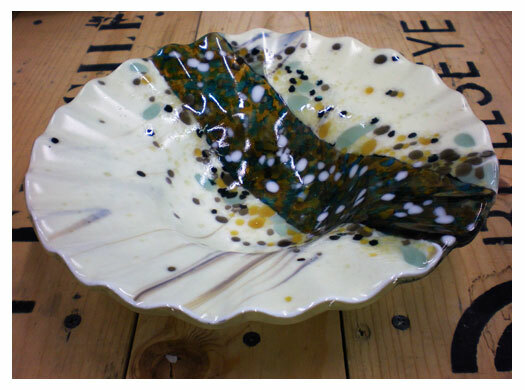 This month it was the 20" bowl above and a series of smaller accompanying pieces. The bowl is bright, bold, trimmed with the twisted can I had made earlier that month. I taught workshops at Wired Designs Studio including plate making and powder techniques. The above picture is of student pieces getting read for their second firing to be slumped into plates. With all the excitement at home, I was pleased when it was time for a long awaited family vacation to Chicago to rest, relax and recharge. We saw a couple of ball games, walked the city streets and enjoyed wonderful dinners. The trip was not without it's own excitement including canceled flights, heat waves and directional mishaps... but that's just part of the adventure. Back from Chicago there wasn't much time left before the International Society of Glass Beadmakers (ISGB) annual Gathering. I was helping a friend who made these fabulous sculptural faces from borosilicate glass to trade at the Gathering. I coldworked the surfaces to remove the typical shiny surface leaving a more mat finish to invoke a stone like image. Arriving in Seattle for the ISGB Gathering was a pleasant change of scene; cooler climate, green trees, water and mountain vistas. So much happened on this trip I don't know where to begin. There were late nights with good friends, scenic drives, a visit to Bullseye glass, farmers markets, henna, hikes, gallery tours, workshops, conference lectures, the Bead Bazaar, local art fairs, and so much more. I learned a few things and picked up some inspiration. 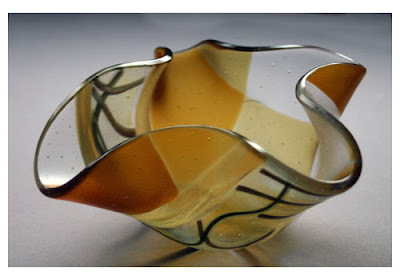 Sam from Dream Fire Glass did such a great job posting our journey you'd best take a peek at her posts. Things didn't slow down in August. 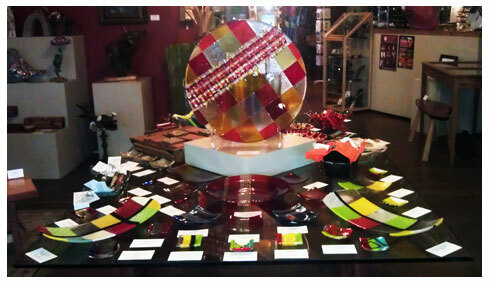 I have worked with the San Antonio Glass Art Guild (SAGAG) to plan our programs and events like ART281. I taught and took a few workshops at Wired Designs Studio. I'm working on new projects and getting ready for fall shows. Going forward try to do a better job of posting on a more regular basis. Today is the Summer Solstice. It is officially Summer, although most of here in South Texas would swear Summer started months ago. To usher in the summer months here is a fabulous Etsy treasury on Summer Colors including yours truly. • Election of officers - This will be my last official meeting as President of SAGAG. I have enjoyed serving in this role for the last three years and look forward to seeing the direction new leadership will move our organization. Tonight's meeting will be the members’ opportunity to elect a new board of officers. This is always an important part of our duties as members. I encourage all SAGAG members to participate. • Volunteer Award Nominations and Voting - In 2011 SAGAG created a Volunteer aware to acknowledge, encourage and retain those members who contribute their time and energies to the guild. Nominations are accepted from our general members and must be turned in prior to tonight’s meeting at 7:00pm. All nominees will be acknowledged and the guild will vote for one to be awarded a paid membership for the upcoming year. • Membership Renewal - To encourage timely renewal members are encouraged to pay membership dues by check or cash during this evening meeting. Those who renew tonight will be entered into a drawing for a free membership. One lucky winner will be returned their membership fee. • Show and Tell - To add to all the festivities we are creating the opportunities for members to bring a piece of work and show us what you've been up to this past year. This is a great way to share with friends, get ideas and ask for feedback from your peers. ﻿Hope to see you there. This weekend was all at Wired Designs Studio. When I'm at Wired Designs these days, I am generally teaching a workshop. This weekend I was over joyed to have the opportunity to both teach and take a class. Saturday was a delightful day in Fusing I. I love to witness the excitement people have when working with glass for the first time. The ohhhs and ahhhs when they see their first piece come out of the kiln. That happened Saturday afternoon when this group of ladies saw their dichroic glass pendents came out of the kiln. A little cutting and grinding to get them into just the right shape (like Sue's heart on the bottom left of the kiln below) and back in the kiln they went for a fire polish with the tack fused art glass projects from that afternoon. Now that they understand a little about the impact of time and temperature on glass, the next step for Saturday's group might me taking something like Platemaking on June 23 and 24. 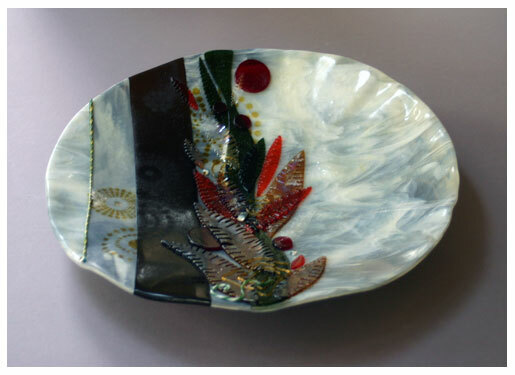 In Platemaking they would learn about volume control, begin to take their cold working skills to the next level and learn what goes into slumping kilnformed glass into a mold to take the shape of a plate platter or bowl. On Sunday I got to sit back, relax and learn all about etching metal in one of Gail Stouffer's fabulous metal jewelry workshops. I had a great time hanging out with friends and learning new techniques. 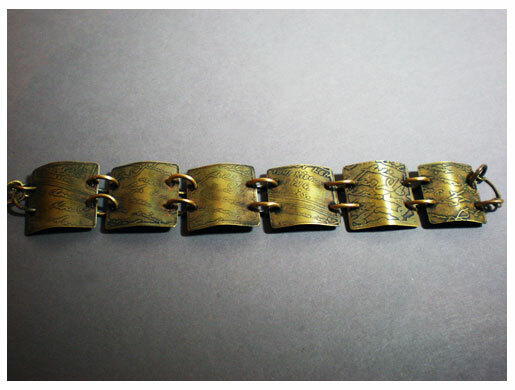 Check out the bracelet I made in class (below) using metal we etched earlier that day. The pattern came from sections of a stamp I picked up earlier that day on a "field trip" down the block to Stamp Antonio. I'm grateful for the opportunity to try something different. This is one technique I'll be using again for sure. 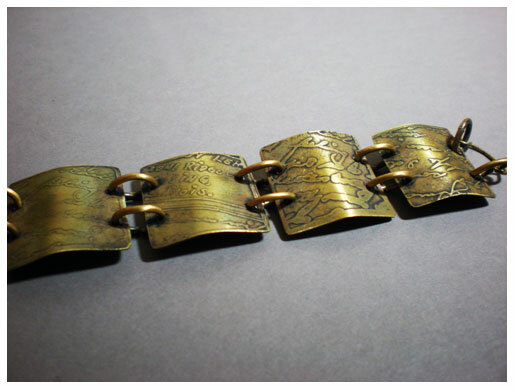 Bracelet made of etched brass. Driving the 68miles through the Texas Hill Country each month on my way to Artisans of Rocky Hill has given me a much deeper appreciation of the changes that come with each season deep in the heart of Texas. How quickly we went from bright colorful carpets of spring wildflowers to more rich golden hues. As the temperatures rise the blues and purples of Bluebonnets and Verbena give way to reds, yellow and oranges bringing Mexican Hat, Black-eyed Susan and Firewheel. As the flowers go to seed the grasses rise crisp and golden in the sun. My drives to Fredricksburg are little escapes. I return home with the pictures of the every changing Hill Country landscape in my mind. I can't help it if every now and again a little seeps back out into my work. Thank you Lisa for including me in this fabulous treasury. Friday night was the closing night of the San Antonio Calligraphy Guild Spring Exhibit. Would you believe the kiln-formed glass piece above hung in that show? What you are missing in this photograph are the two sheets of clear glass upon which I carved the 37th chapter of Genesis. 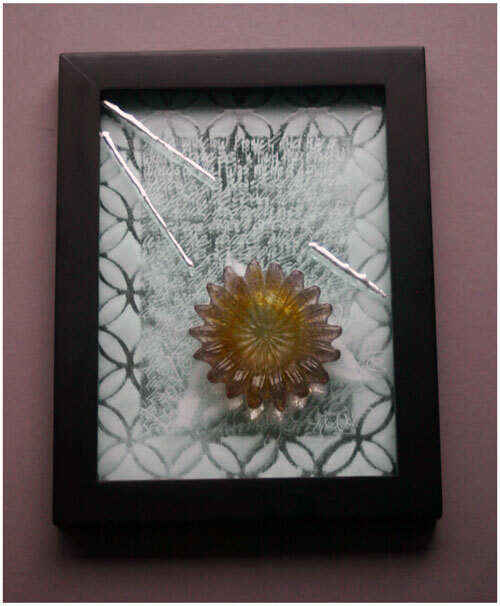 The focal piece above was mounted and framed floating above those two sheet of glass. It was the story of Joseph that was the backdrop for this contemporary swatch of fabric from his coat of many colors. Ripped clear through with the lines of the formal cannon this work was strongly influenced by my exposure to calligraphy and bookbinding. This years Spring Exhibit was a diverse display of calligraphic marks on not only paper and vellum, but glass, clay, stone, and fabric. 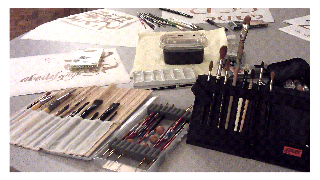 I found it exciting to see the work being done by calligraphy guild members in so many mediums. What a fabulous show! Thank you Gabriele for all your support. It always means something special to me when I know piece has found a good and loving home. It's been well over a week since Luminaria and I still feel like I'm basking in the glow of lights. San Antonio has a long rich tradition of being a parade and festival friendly city. Match that up with the local art scene and it just doesn't get much better. Once again Glass Alley was complete with flame workers, Larry West demonstrating in his mobile glass blowing furnace, the Brother of the Flame, the San Antonio Society of Artisan Lampworkers (SALSA), and members of the San Antonio Glass Art Guild (SAGAG). We occupied space between the Institute of Texas Cultures and the Tower of the Americas. 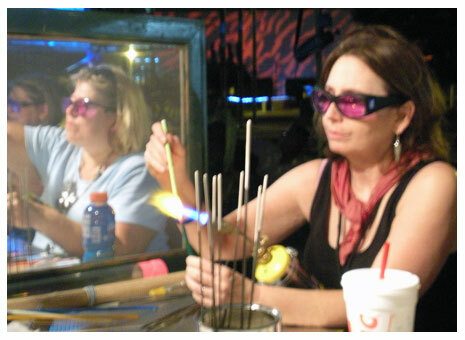 With a view of the Tower and the fire dancers, members of the local glass guilds demonstrated flame working techniques and educated the public on the local art glass movement. Members of SALSA demonstrating on the torch. Thank you Louise and Denise, devoted SAGAG members, for all of your time and effort without which Glass Alley 2012 would not have been possible. 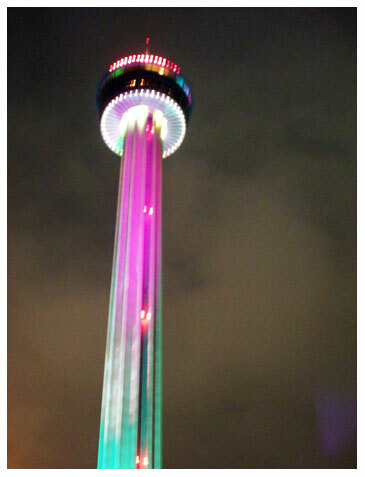 The San Antonio Glass Art Guild (SAGAG) has participated in Luminaria every years since the events inception. 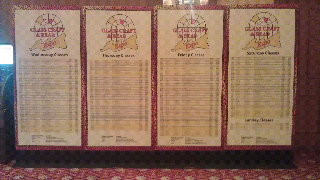 Look for Glass Alley this year in the yellow zone, #11 on the Luminaria map. 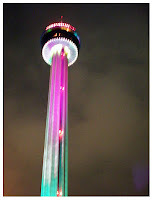 For more information about Luminaria visit http://luminariasa.org/. Three fun Etsy Treasuries from the month of April all featuring pieces from the same blue and white set. I have never created a Treasury myself but I do enjoy perusing those invented by others. They're such fun and creative collections. Glass Craft Expo - Day ??? I think it's day five but frankly I lost track. Workshops have been wrapped up. Time for one last round on the exhibt floor and then I'm out of here. 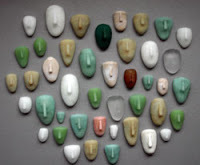 Sixteen students in Beyond Dichro - The Power of Modern Jewelry. What a blast. By the end of the day I was spent. 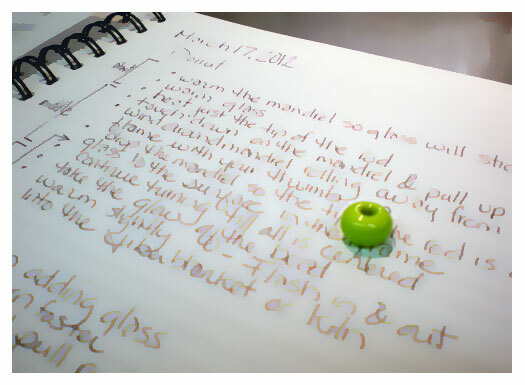 It's now day four and I'm taking a few minutes to post while Gail lectures on electroforming on Glass. I always love when science finds its' way into our creative processes. Multi faceted TA that I am, today I was on the other side of the exhibit hall helping Sam with a full class for Twist and Shout. I was thrilled to find both bead makers and fusers expanding there skill set with this workshop. Taking workshops on the road. 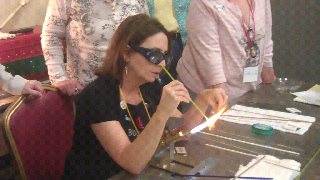 Day one of Glass Craft Expo, I backed up Gail with Glass Collage. Class with Gail is always a blast. One day of TA'ing (teaching assistant) down. Three to go. This weekend is plate making at Wired Designs Workshop. 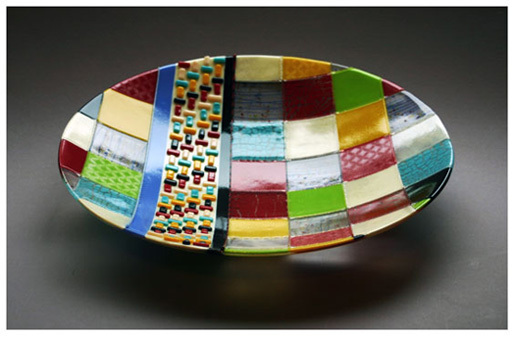 I will be working with students as they learn to create functional plates, platters, bowls and other glassware. 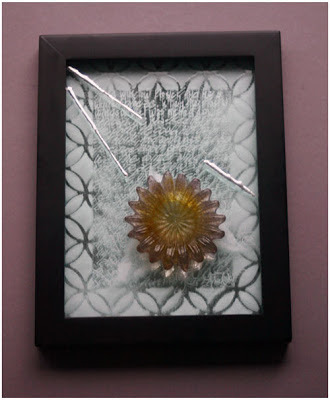 We’ll design our own flat glass pieces on Saturday. 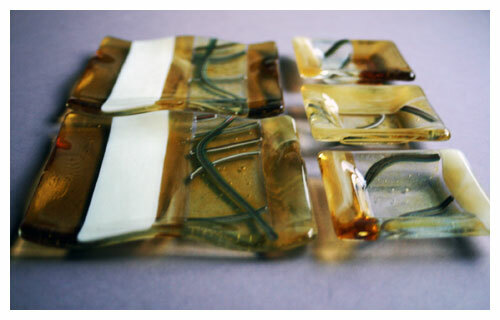 On Sunday students will learn to cold work and slump their glass into original serving pieces. Topics covered include: mold preparation, firing schedules, cold work, and annealing. Here is one of the demos from my last plate making workshop. Wonder what I'll do this time. Guess I should start thinking about that. 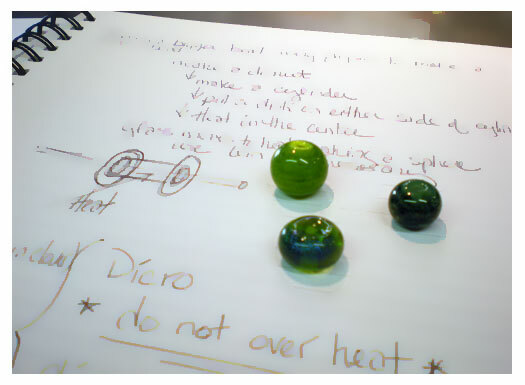 Today was Bead I at Dream Fire Glass Studio. In the spirit of St. Patrick's day all my beads were green. I used opaque and transparent spring green, jade, mineral green, adventurine, and Sam's new rolling in clover frit blend. It just seemed fitting, not to mention fun. 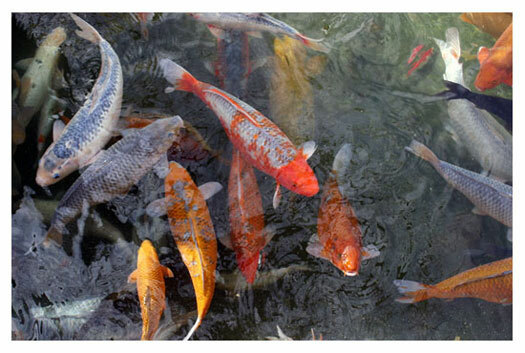 I took this shoot a few weeks back while visiting the Japaneses Tea Garden. I was staring though my view finder when I had a sudden feeling of familiarity. Only it was exactly deja vu. It was more like deja "you". It wasn't like I had been here before or done this before. It was a thought of someone. I as still very much in a new experience while at the same time, for brief moment, I heard a distinctly recognizable voice. I smiled, cause I had heard it all before. I'm sure there is a more appropriate physiological term for this type of memory. But deja "you" works too don't you think? 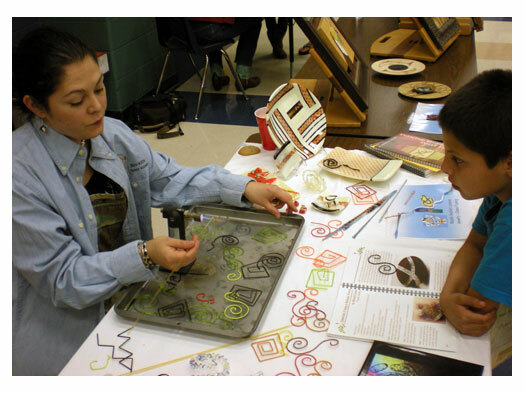 The Carnahan Elementary School Art Walk was last week. This was my 4th year participating. I was thrilled to see the continued growth of the event and the children's excitement at being exposed to so many artists in a variety of media. I bumped into several good friends from both the San Antonio Glass Art Guild (SAGAG) and the San Antonio Calligraphy Guild (SACG). Always so but particularly in this day and age of decreasing school budgets, it is important that we do what we can in our local communities to promote the arts and art education. I had the right size flame for an elementary school event. Using my little butane torch I bent 2mm strands of glass into spirals just as outlined in the tutorial in the SAGAG cookbook. This is a great demo to discuss the role of science as we work with heat control and gravity to achieve our desired results. 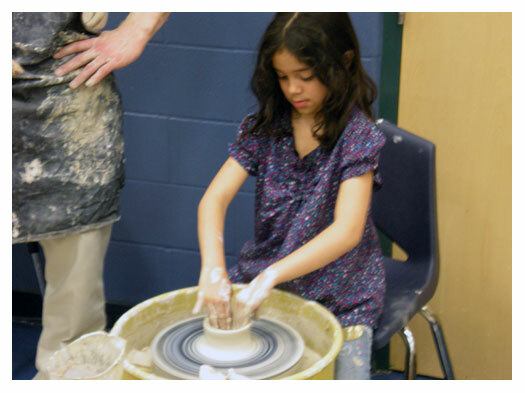 Right next to me children were taking turns trying their hands on a potters wheel. I thought Juliet did great for her first time. 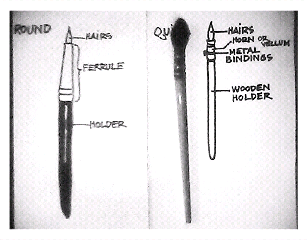 Craftmanship must just run in the family. Great job kiddo! It has just been announced that Saturday's Luminaria festivities are being postponed. In light of our current weather, I am somewhat releaved. Keep you eyes on the Luminaria website for updated information. and I'll keep you posted on Glass Alley's roll in any rescheduled event. On the bright side, great weather to cozy up to a dual fuel torch and make some more glass components. Tonight is afterall fiery Friday at Dream Fire studio. With all my time at the torch, I have acquired quite the assortment of twisted canes. It was time to put some of these components to work. So, I decided to create some colorful kilnformed pieces featuring these flame worked elements. Here they are going in for their first firing. I always loved how cooking shows on television could put in an an uncooked chicken and at the same time pull out the finished product. 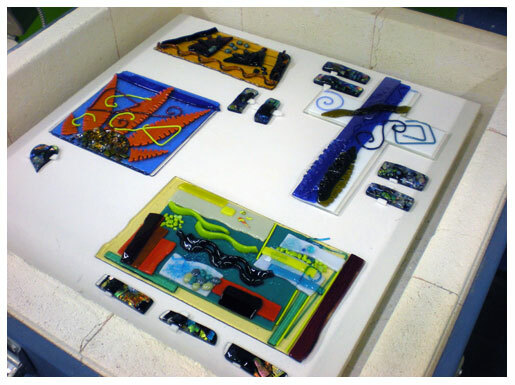 Inspired by the "magic of television" here are those same pieces just out of the kiln after their second firing.